Posted on July 6, 2015 by I Never sign out at work. Finally arrived in Zurich after an early start from Glasgow and several trains, planes and buses I met up with Robbie in his van to head up to the Swiss Ratikon. We stopped on the way to grab some supplies (Cherry harribo…obviously) for the next few days and headed up the sketchiest road I’ve ever been on up into the valley. We set up camp by a lovely waterfall, it’s the perfect shower when your roasting from waking up in the tent, it’s been up to 38C here, mad!! There’s a local hut nearby where some other climbers are staying and on our first night we also met some awesome Germans that are here hiking who offered us some German beer and sausages, just to be the perfect stereotype. It’s also a reminder of how cool it is to be travelling and meeting so many new people that are all so friendly. 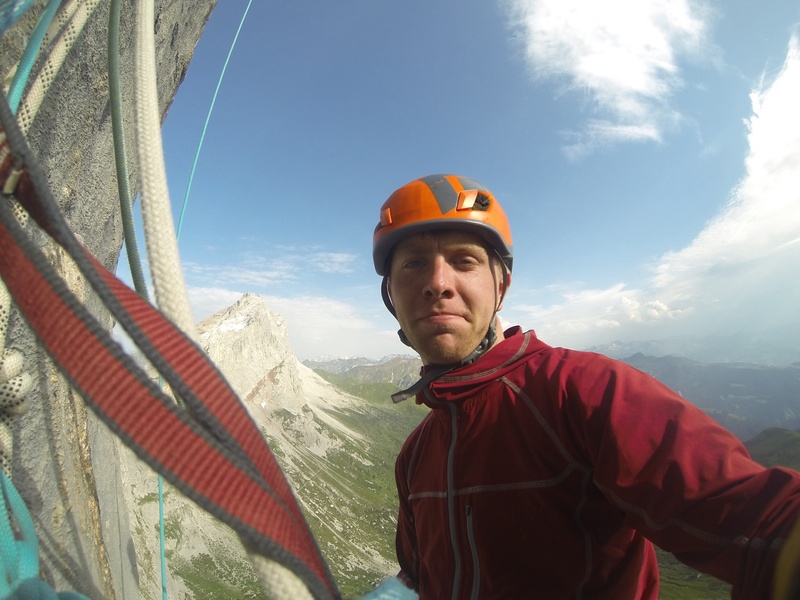 We started climbing yesterday on Robbie’s project route ‘silbergeir’. It’s this awesome multi-pitch route that’s goes straight up the headwall of the massive cliff. The wall is all limestone that varies in every direction with jagged blue streaks cascading down through the yellow rock faces. The routes max difficulty is 8b+ which of course, Is down to Robbie to climb but I’m really enjoying climbing the grade 7 pitches and starting to work on the 8a+ pitch. 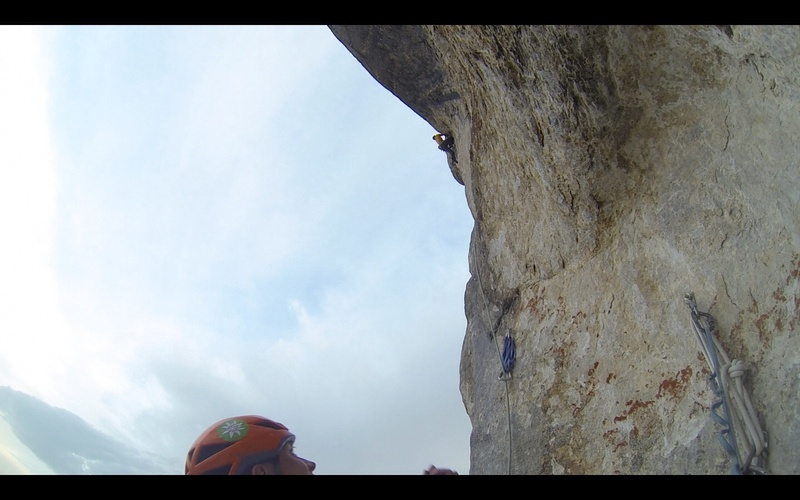 It’s all very technical moves on small holds where one little lack of balance and your off…there’s been a lot of that. Robbie made some huge links on the hardest pitches yesterday it was awesome to watch him crushing out some crazy hard moves and I don’t doubt that after another session working the route today it could be time to get a well earn rest day before going for the red-point ascent later in the week. Just being up there on that wall is amazing though, belaying from your little wooden swing, suspended hundreds of meters above the valleys grass fields with the high snow capped mountains as your backdrop and the cowbells from below as your soundtrack. I’ll try to keep writing to update our progress but the signal strength out here is marginal at the bet of times!